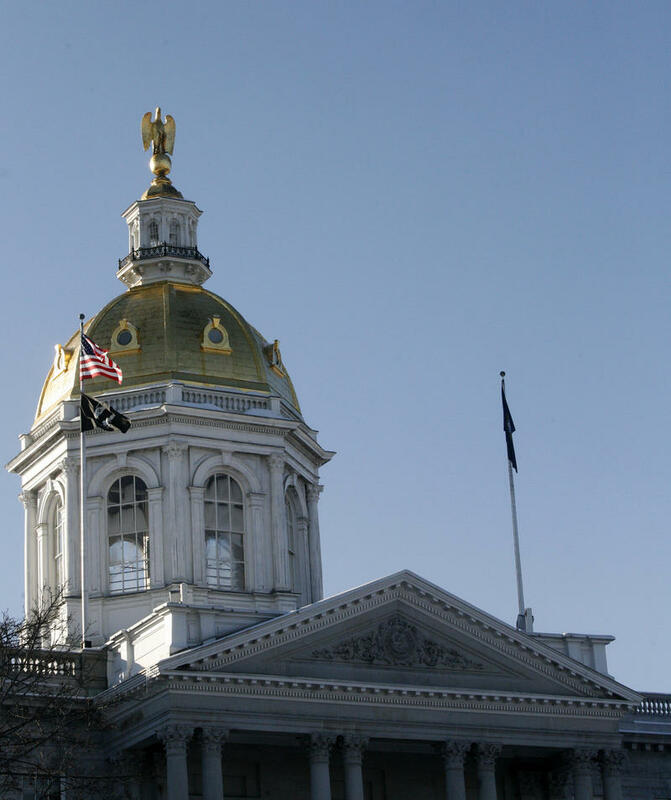 CONCORD – The House passed an amended bill to legalize marijuana and a bill that would make it a class A misdemeanor to carry a firearm on public school property on Thursday. The House voted on an amended HB 481 that would tax weed at the lowest rate in the nation. It passed 200-163, but concerned some lawmakers who were opposed the tax structure. The bill removes the original proposal for a fixed excise tax at the cultivator/wholesale level of $30 per ounce. Instead, it levies a tax at two levels: a 5 percent tax on the wholesale/cultivator sales price and a 9 percent tax on the retail cannabis store sales price. The tax will be lower than surrounding states that have already legalized marijuana, yet the revenue projections would remain the same at about $31 million per year, legislators said. On Feb. 27, the House voted to pass legalization 209-147. But because it would add to the state’s revenue stream, it went to the House Ways and Means Committee where it was retooled. Rep. Fred Doucette, R-Salem, said while legalization is a bipartisan issue, the bill states a “tax shall be levied,” and he had a problem with that. Doucette asked legislators if they are willing to support a sales or income tax. Doucette said constituents want to know if he supports a sales tax, adding he does not. Rep. Alan Bershtein, R-Nottingham, said this bill is not a panacea but it works to reduce the size of the black market on cannabis. Rep. Stephen Pearson, R-Derry, said projections for revenue are over-inflated as market saturation on the west coast – where legalization has already passed – has found prices of marijuana dropped dramatically from $5,500 a pound to $300. “The black market has not been reduced, it has exploded,” he said. Republican Gov. Chris Sununu has not supported legalization in the past. The bill must also pass the Senate before it gets to his desk. House Bill 564, which would make it a Class A misdemeanor to carry a firearm on public school property, passed the House Thursday by a vote of 213-159. It was amended to allow school boards the ability to approve teachers and others who could carry firearms. In his minority report, Rep. John Burt, R-Goffstown said he was against the bill. “This bill creates the illusion of safety by attempting to remove firearms from schools and school grounds. The actual effect of the bill is the disarming of law-abiding citizens creating even a greater danger for the children that attend public schools,” the report said. Supporters said the amended bill would allow school boards to authorize individuals to carry weapons. “The presence of firearms in our schools disrupts learning environments and takes school personnel and resources away from their primary job of teaching our children,” said Rep. Mary Heath, prime sponsor of HB 564. “The New Hampshire House shares the financial concerns of first responders, state employees and retired teachers who served New Hampshire. This legislation limits the COLA to the first $50,000 of pension benefit, assuring that benefits are provided to those who really need it. I thank the House for its strong vote today to better align state retiree benefits with the cost of living,” Ley said. A bill that would increase fines for speeding Off Highway Road Vehicles, HB 630, also passed 292-81. It also now heads to the Senate. Rep. Burt opposed this bill, expressing concern it would have a negative impact on the North Country economy by discouraging four-wheelers from coming to the state. He also said he was concerned the money from increased fines would not go to private landowners but to the state. The fines are considered laughable by scofflaws, supporters said, because they are so low. A measure which would give protections to elderly and handicapped from abusive third parties, House Bill 696, passed 219-156. The bill would allow for weapons to be removed from individuals who were considered to be abusive or threatening, similar to that allowed for domestic violence cases. Rep. Renny Cushing, D-Hampton, the sponsor, said there should be a way to remove weapons from individuals who would threaten to kill an elderly person if they talked about the abuse they have suffered. “We passed a law that made domestic violence a crime,” he said. This, he said, would give the same sorts of tools to the elderly and vulnerable adults as domestic violence victims, he said. The bill will now be moving on for consideration in the Senate. A bill that would create an ombudsman to hear concerns on right-to-know matters was killed on a vote of 203-165. Rep. Mary Beth Walz, D-Bow, said the bill was not ready for passage and questioned what the $48,000 in the bill would cover. She said it was unlikely to find a lawyer with 10 years experience willing to work for $48,000. Rep. Charlotte DiLorenzo, D-Newmarket, said that the position would provide a faster, cheaper and easier way to resolve right-to-know disputes and she thought there would be retired lawyers willing to take the job.